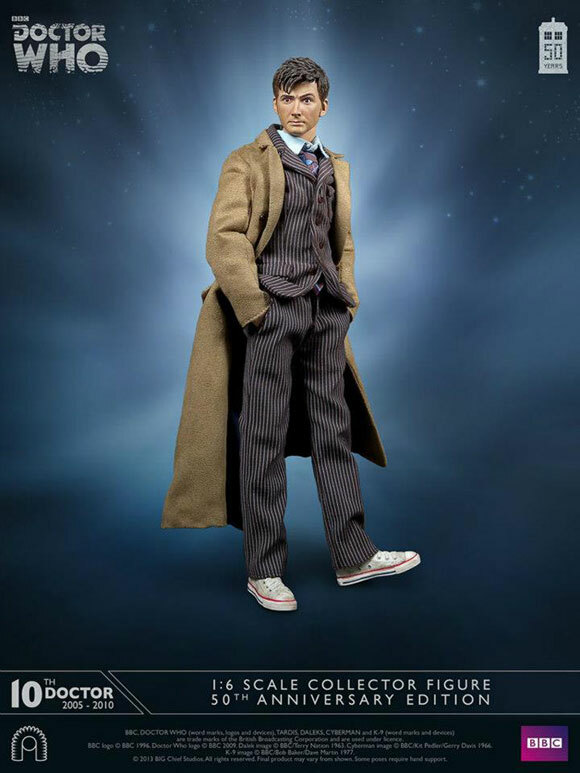 BIG Chief Studios are proud to announce the 50th Anniversary Tenth Doctor 1:6 Scale Collector Figure Pre-order. The Tenth Doctor is ready to embark on his next time-travelling adventure, in his brown pinstriped suit and trademark trench coat, his ever-present Sonic Screwdriver by his side. The Doctor comes complete with numerous accessories including his spectacles, 3D glasses, fob watch, psychic paper wallet and water pistol. With eight interchangeable hands to adopt various poses and an illuminating display base, this is the ultimate collectable for fans of the Tenth Doctor. The 50th Anniversary Edition is limited to only 1000 pieces worldwide and the 50th Anniversary Signature Edition ( sold out ) is limited to only 250 pieces worldwide. Both editions are exclusively available from www.bigchiefstudios.co.uk and will not be sold via other retailers. Will this ever come back in stock? Or is it sold out for good? It’s either £169.99 or £189.99. What’s the difference between the 10th Doctor Signature Edition and the other one? Yes that’s correct. The sig. edition comes with a signed and numbered plaque. The figure iteself, the packaging and accessories are identical in both versions. I’ve pre-ordered one, but when are they due to arrive? It’ll be a long wait. They always push the release date several times because of problems. I think the Amy Pond doll right now is scheduled for April and it went up for preorder quite some time ago. 11th Doc I think took around a year to arrive after preorder. I’d say from past experience it’s likely Big Chief will average a doll a year. Eight to twelve months for Doc 10 I’d wager. I’m sure they’ll improve their production times with each incarnation (and I think they’ve been working on the 10th Doctor for quite awhile already), but yes, you’ll be waiting for some time. They’ve said on their Facebook page that they’re aiming for July. What kind of problems do they have ? Shipments being sunk ? Who says they’re having problems? It takes time to manufacture and deliver these kind of things. Umm probably because they’ve had problems with every doll before this one? They are a small start up company. They are learning as they go. This one will likely get pushed back by problems just like Doc 11 and Amy Pond. Big chief have been very good at keeping people informed, they have had factory problems amongst others. Oh wow, I missed out on the sig. edition. I managed to pre-order one of the signature editions on Thursday. I can’t wait for it to come, though it looks like it’ll be a while. Actually the limited edition is 1000 pieces not 750. 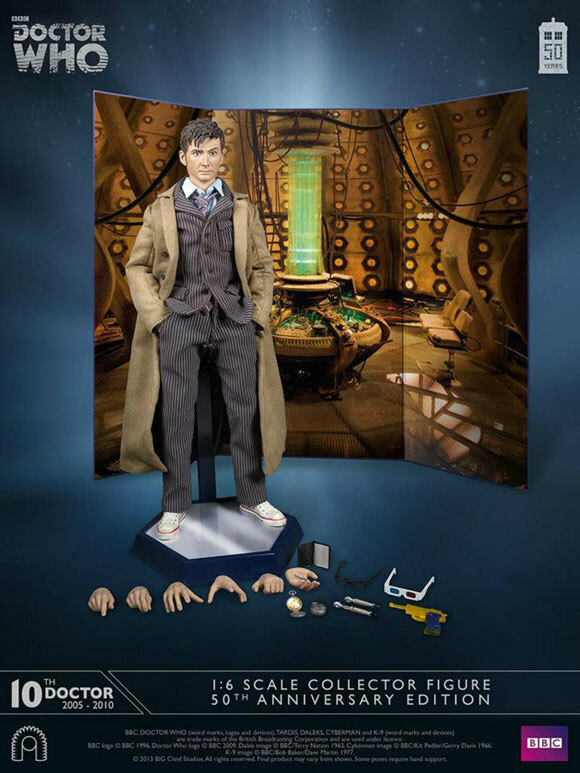 The signature is 250 pieces for a total of 1250 of the Tenth Doctor 50th Anniversary figures. I’m just not a fan of the 10th Doctor, his outfit would work better in a comic book, but onscreen it does nothing for me and as an action figure or a doll it also fails. I will have to wait for them to come down in price, but when they do I will probably get a classic Doctor first, save the Eleventh Doctor for last, since he is the newest I guess. They are selling out. They won’t be coming down in price. I think all of 11th Doc are sold out and 10th looks likely to sell out well before it is available.